This scene is burned in my mind as representing the three women Stella Jacob, Karen Holt and Sharon Simmons. The following animation frame count was thinned by about 75% to manage size while still capturing the action which lasts almost 4 seconds in real time. This scene follows the frames included in Denis Morissette's Darnell compilation showing the women while still on the pergola patio, which after duplicate frames are removed lasts a little more than 1.4 seconds. The women have now left the pergola patio and are on the grass still walking eastward. Off camera to the right there seems to be one or more people interacting with the women. Sharon points with her left hand's index finger over her right shoulder – perhaps indicating where they stood during the shooting. Karen displays her horror of the event while raising her open right hand to her chest as if to punctuate what she is saying. Stella is more animated yet, boldly splaying her hands while rolling her eyes skyward, seemingly with a slight grin grimace on her face. While a little hard to detect in the very late frames, Darnell and the women stop walking but the women continue to interact with those hidden figures out of frame. Are they being interviewed by reporters or law enforcement? Obviously, I don't know, but at some point Jacob, Holt and Simmons talked with Deputy C.L. “Lummie” Lewis of the Dallas County Sheriff's Department. 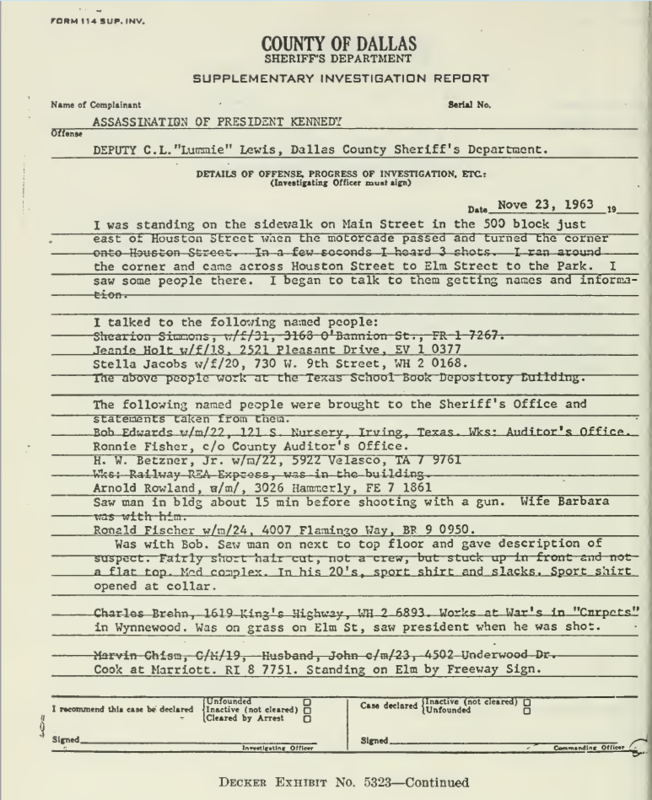 In his supplemental investigation report November 23, 1963 he specifically wrote on page 1 that he talked with these three women. This scene is burned in my mind as representing the three women Stella Jacob, Karen [sic] Holt and Sharon Simmons. The following animation frame count was thinned by about 75% to manage size while still capturing the action which lasts almost 4 seconds in real time. This scene follows the frames included in Denis Morissette's Darnell compilation showing the women while still on the pergola patio, which after duplicate frames are removed lasts a little more than 1.4 seconds. The women have now left the pergola patio and are on the grass still walking eastward. Off camera to the right there seems to be one or more people interacting with the women. Sharon points with her left hand's index finger over her right shoulder – perhaps indicating where they stood during the shooting. Karen displays her horror of the event while raising her open right hand to her chest as if to punctuate what she is saying. Stella is more animated yet, boldly splaying her hands while rolling her eyes skyward, seemingly with a slight grin on her face. I'd never seen that clip or that document before. It makes sense that Lummie would have been talking with them or at least listening to them there. They were well off the Pergola Patio at the time. Looks as though Jacob has a scarf around her neck and that she is somewhat "bucktoothed". Two men pass from left to right behind them. I wonder who they were, and whether or not they were caught in any "time stamped" photographic images around the Grassy Knoll after the assassination? Behold, I give you (from left to right) Westbrook's "Probably Carol Reed, Definitely Gloria Calvery, and Me, Karen Westbrook!" I have Holt's e-mail address...I wonder if I could get this to her? Nope. Westbrook didn’t look at the Darnell footage. Try again. Again, Mr. Clueless, nobody is claiming that Calvery is one of the Darnell women. No, Iacoletti. You and Westbrook are claiming that Calvery is one of the Darnell gals, but you evidently don't realize it. The three gals in Towner and the three gals in Darnell are the same people, and they are also visible in Zapruder "by" the Stemmons Sign. Simmons is the one wearing the blue headscarf, Holt is the one with the strawberry-blond hair, and Jacob is the one with the poofed-up black hair, the dark complexion (as can be seen in Z-60, etc), and the off-white skirt and dark brown jacket. I don't know what Westbrook interview you think you saw, but in the one I watched, the Darnell clip wasn't shown or discussed at all. I know that your opinion, but that's all it is.